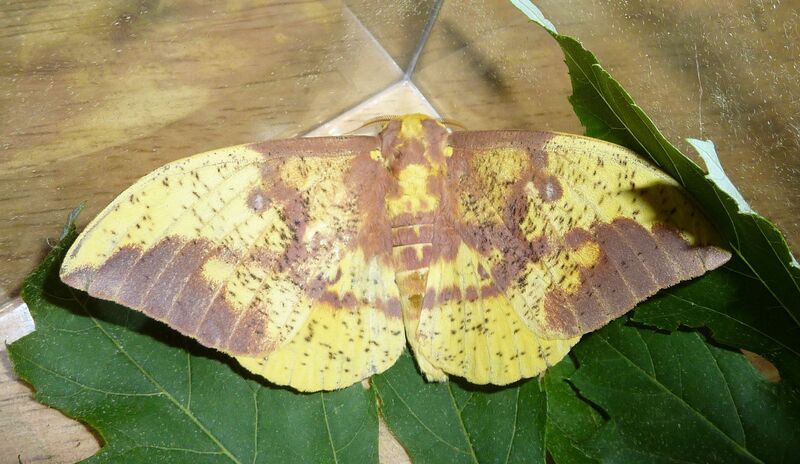 Imperial Moths are emerging, Eacles imperalis. In the northern part of North America they only have one generation, adults only live for 2 weeks, and from the earliest ones emerging to the last ones hatching out, they're only around for 3 to 4 weeks of the year. They're one of the few (the only?) giant silk moths who's caterpillar stage burrows underground to spin a cocoon. The result, (come July!) is the adult moth emerging from the burrow, a shallow one I believe and scurrying along the ground looking for something to climb. Once elevated they inflate their wings to take flights. Males are the first to emerge I believe and typically have more purple/brown in their color scheme. Pictured above is a male I believe, though they typically come darker. Females are almost completely yellow but maintain the longer stripe of purple/brown along the wings. In the off chance this was a female (which I still might be wrong about) I decided to keep it over night in a dark place. In the morning there were no eggs so I decided to let it go. Assuming it was a female though there's a tactic you can use to get them to lay in captivity. Unmated females don't usually lay eggs, but if you put them in a bird cage they might attract a male right to the cage. You can stick him in with her, assuming love can't take place through the bars, and afterwards you can set the male go, and let her lay some eggs before releasing. Host plants include:Pine, Basswood, Birch, Cedar, Elm, Sycamore, Walnut, Oak, Box Elder, Maple, Sweet Gum, Sassafras, and other woody species. There is a subspecies called pini which feeds only on Conifers, and has paler males than usual. Caterpillars come in a range of colors depending on what host plant they're on, see some of them Here. Remember though to complete their life cycle they'll need some sort of medium to burrow around inside. If you feel unable to accommodate them over the winter then consider releasing them into some leaf litter. CORRECTION: I'm told by a reliable source that the wing patterns aren't accurate for determining male and female. Males tend to have bigger "fluffier" antenna while the female is more strand-like. Another good mating cage for the larger silk moths can be made from plastic snow fencing. I wrap it into a cylinder, cut pieces for the ends, and tie it together with twine. Put a female in and hang it outside after dark so the birds don’t get the moth. Retrieve before dawn or the birds will have breakfast.